Sheikh Mohamed is a Bahraini entrepreneur, the founder and Chairman of the Mashael Petroleum. Through Mashael, Sheikh Mohamed has initiated several petroleum projects in line with his commitment to nation building and environmental protection. Besides being in the Oil and Gas business, Sheikh Mohamed represents and works with several International firms in construction, real estate, engineering and materials testing. His wide-ranging interests also include producing several motion picture projects. Away from business, Sheikh Mohamed is a highly skilled martial artist and is currently the Honorary President of the Bahrain Martial Arts Federation. In 2011, he was inducted into the "Taekwondo Hall of Fame" by the World Taekwondo Headquarters in South Korea ("Kukkiwon"). He is the first recipient from the Arab Nations to be accorded this honour. Mr. Al-Sayed started his career in 1965 with the Bahrain Petroleum Company (BAPCO). After 44 years of distinguished service, whereby he assumed numerous senior leadership positions including being the Chief Executive and headed several major strategic and modernisation projects, Mr. Al-Sayed retired from BAPCO in September 2009. Mr. Al-Sayed was also appointed to various top positions such as the Chairman of the National Committee of Negotiations for Gas Imports to the Kingdom of Bahrain as well as the Gulf Area Companies Mutual Aid Organisation (GAOCMAO). He is currently on the Board of Trustees of both the University of Bahrain and Bahrain Polytechnic. For his various contributions, Mr. Al-Sayed was awarded several prestigious awards, namely the Outstanding Engineering Pioneer award from the Gulf Engineers Federation in 2008, the Toastmasters Personality of the Year award in 2009 and the Fellowship of the Institute of Leadership and Management (ILM) – UK. Mr. Al-Sayed is a registered Chartered Engineer (C.Eng) – UK and holds a First Class Hounours Bachelor's degree in Mechanical Engineering from London, UK. He also holds MSc/DIC in Mechanical Engineering / Thermal Power from the Imperial College of London. She works as the Office Manager and PA to the Chairman. She is responsible to work with the Chairman for key management decision making process. She's been working with the Chairman and Senior Leadership Team through regular correspondence, arrange meetings and prepare briefing materials for the Chairman and responsible to maintaining internal company process and activities at Mashael Group. He is having more than 10 years of work experience in oilfield industries with extensive exposure to Business Management and Marketing Communications Management. 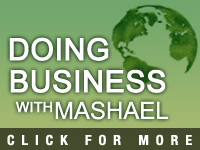 At Mashael he handles projects with multiple stakeholders,legal assessment in contracts and documents involved in the projects in accordance with business procedures of the company. Prior to Mashael group he has held many prestigious positions which includes being the Ambassador of Venezuela in United Arab Emirates from 1991 – 1992 and held many top positions in various corporates giving him all the experience to spear head Mashael's business activities. Mr. Al Murri is active in the development of business opportunities for Mashael Group. He has established key relationships in the GCC region, particularly in the Kingdom of Saudi Arabia and United Arab Emirates. Mr. Arekat is a finance and investment professional with over 24 years of diverse corporate finance and investment banking experiences. Ziyad managed a number of successful primary offerings in the GCC region for both equities and debt instruments for both government and private sectors. In his capacity as Finance Advisor at Al Mashael Petroleum, Ziyad is responsible for the structuring of financial related matters relating to the trading business as well as supervising the investment functions of the Company. Mr. Wheatley heads the Operations Department of the Group. Prior to this, he has served as operations manager at several environmental companies in Europe and the Middle East. While at these companies, he ensured professional execution of several key projects as well as heading quality control initiatives to ensure all operations are running at optimal effectiveness and efficiency.